Sound financial oversight, processes and procedures are essential to the sustainability and success of any non-profit housing organization, particularly in the face of heightened expectations and requirements from funders and governments. Regardless of role or title, all staff have a part to play in ensuring and supporting financial responsibility and success. On this page, you'll find a number of resources designed to help non-profit housing providers build financial literacy and understanding across their organizations. Purchase the Handbook in the ONPHA store, with preferred rates for ONPHA Housing members and Service manager partners. ONPHA's InfoON series tackles the problems and challenges housing providers face the most, outlining best practices, practical approaches and solutions. These straight-forward resources are a great place to start to learn about key areas of housing management, and they are available exclusively to housing members at no cost. 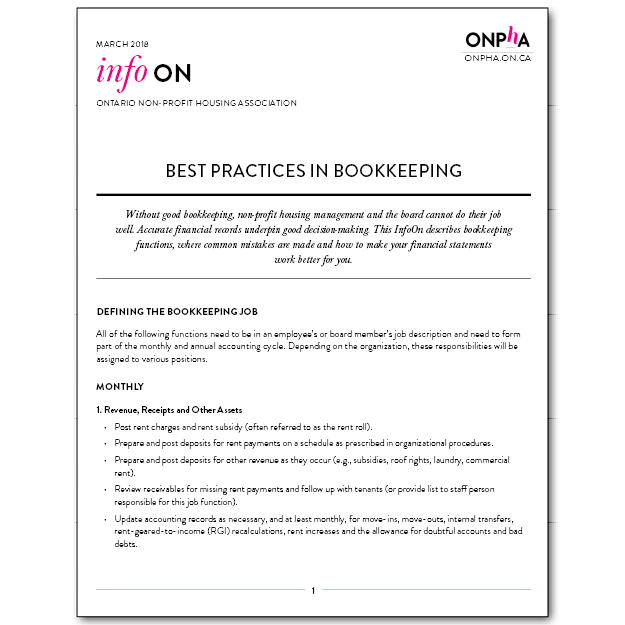 Best Practices in Bookkeeping: Get an understanding of key bookkeeping functions, where common mistakes are made and how to make your financial statements work better for you. Tendering for an Audit: Learn about the process of tendering for an audit, including when to tender, corporate requirements, and principles of the tendering process. Investment Policies for Non-profit Housing Providers: Use this instructional overview and sample to create an investment policy that works within your operating agreement. Internet Banking and Pre-Authorized Payments: Understand the types of internet banking available and the internal controls needed to safeguard your resources and avoid exposure to risk. Regardless of role or title, all staff have a part to play in ensuring and supporting financial responsibility and success. This online course provides a practical overview of the fundamentals of financial oversight and management, enabling learners to be an active part of their organization’s financial success. Course content is delivered through a combination of presentations, reading materials, case studies and video segments, and the course can be completed at your own pace over a three-month period from any internet-enabled computer, smartphone or tablet. This course is available year-round, with start dates in April, September and January.